adidas’s marketing pitch: Light energy-returning shoes. Upper: Elastic mesh with high-density printing, inner sleeve, plastic midfoot cage. Midsole: Full-length Boost foam with firm EVA rim. Plastic Torsion shank, 10 mm heel-to-toe drop. Outsole: Single piece of hard Continental rubber. The Energy Boost 4 uses comfortable upper materials and a brand new Continental outsole, but this cushioned trainer is far from perfect. The Energy Boost V1 was the beginning of a new era in midsole cushioning technology. For far too long, midsoles were made with EVA variants or inserts which claimed to enhance the ride experience. The Boost foam put an end to all that. It won’t be wrong to say that the Boost midsole turned adidas’s fortunes around. At one point, adidas was the number four brand in the United States with nothing exciting to show for. Those days are long gone. Today, adidas is snapping at the heels of Nike, a brand which has dominated the North American footwear market as far as anybody can remember. Nike is still the dominant brand, but adidas is the company which gets most of the positive attention. The Boost platform paved the way for similar technologies in competing brands. Saucony Everun is based on expanded polyurethane, the same tech as Boost. The Puma Ignite sources its material from BASF, the same supplier which manufactures the Boost and Everun compound. Brooks is going to make the switch soon, if news of the upcoming Levitate is anything to go by. 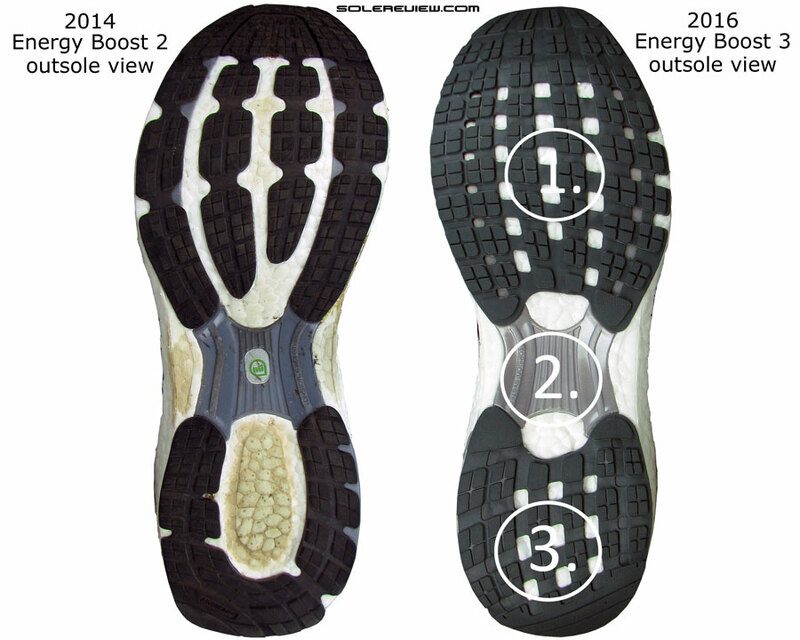 We had a high opinion of the Energy Boost 2 when we reviewed it over three years ago. Imperfections like the rigid midfoot cage and the super tight fit were overlooked in the light of the superior ride experience. But it’s been four years since the first Energy Boost hit retail. So is the granddad of Boost shoes still relevant in 2017? Not if you ask solereview. 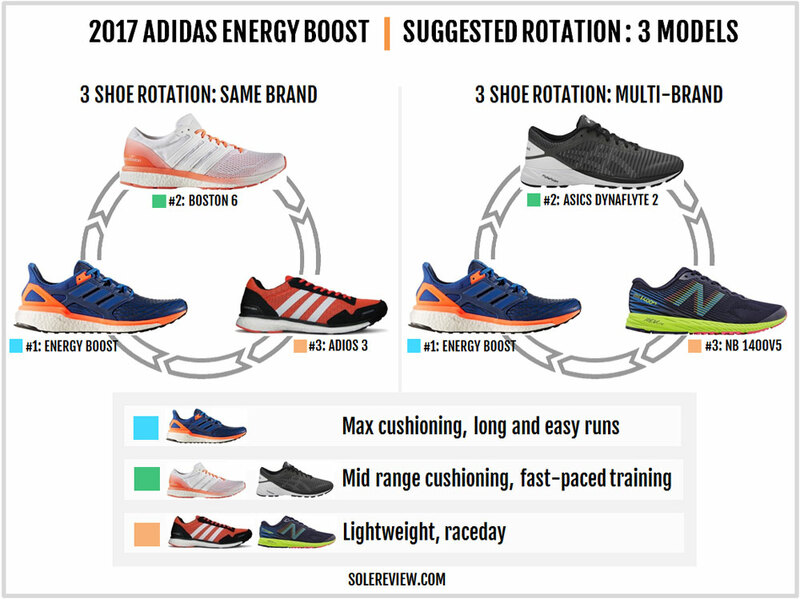 After all, many other adidas models now feature the Boost platform and are a better buy than the Energy. Do you want a soft ride experience? The Ultra Boost is there for you. Need a bit of pop in your runs? The adidas Boston or the adios do your bidding. Need a shoe similar to the Energy, but without the plastic cage? The updated Supernova is cheaper but offers similar levels of cushioning and outsole durability. But these are subjective choices. The issue we have with the Energy is that adidas hasn’t fixed the over-engineering which plagued the previous versions. The midfoot still has that silly plastic cage, and the laces still apply top-down pressure – because there are only four lacing rows doing all the work. 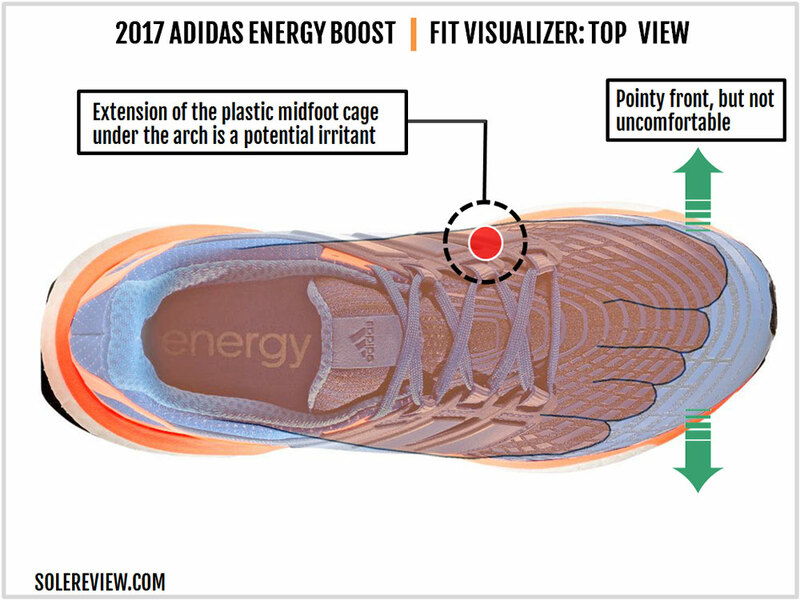 And the midfoot cage design is faulty on the Energy Boost 4 – an issue we’ll discuss this during our fit breakout. There’s the matter of the pricing as well. Sure, a $160 made sense for the first couple of Boost shoes, the same way it did for the Saucony Freedom. But now there’s a plethora of BASF foam equipped shoes, both inside and outside the adidas brand. 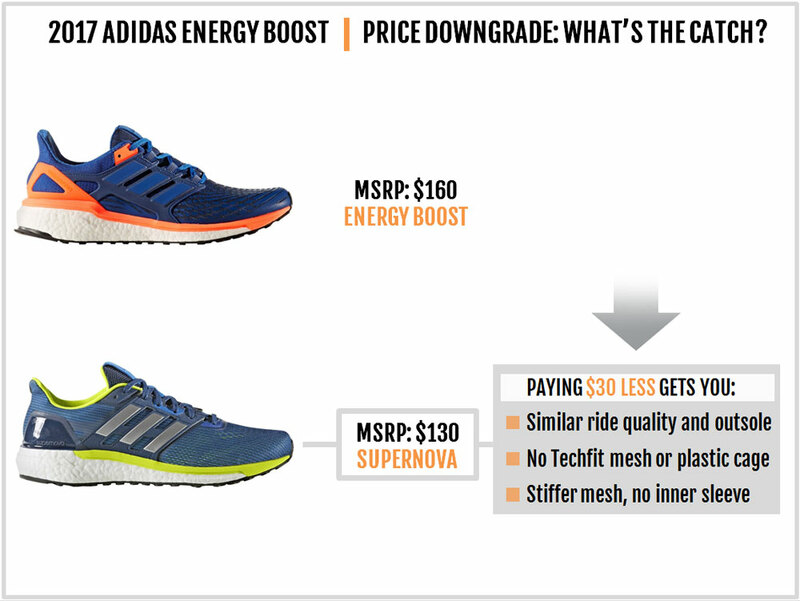 Given the context, it makes sense to get a cheaper adidas or the outgoing Energy Boost 3. The midfoot has the dreaded cage, and the heel has the pronounced Achilles lip. An external heel counter covers either side of the rearfoot and this eliminates the need for an internal stiffener. The tongue is a part of a sleeve, and only four lacing rows (plus one reserve) span the top. A closer examination of the upper reveals the updates. For starters, the ‘Techfit’ mesh used for the upper is much softer and has greater stretch than before. The heel lining has also changed. The new material feels more performance oriented and is similar to what the Supernova Glide 6 – 7 used. At first glance, the midfoot cage appears to be made of a thick synthetic. 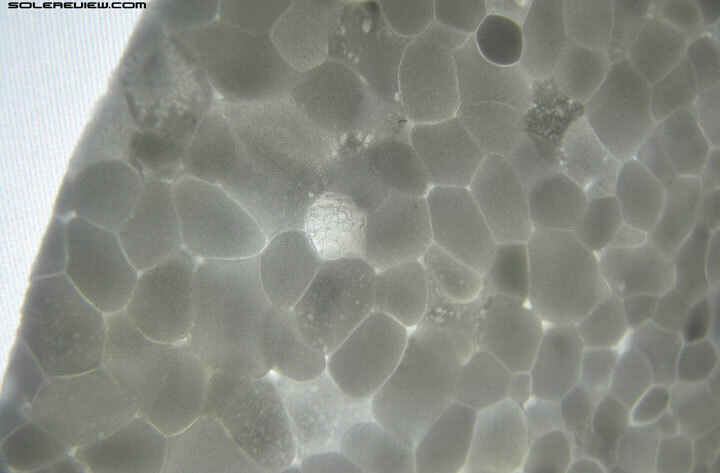 But what you see in the picture is just a coating; underneath that veneer is a thick plastic component. Most of the plastic cage floats over the sleeved upper except for a small portion in the front where it is stitched over. There’s also a change in how the plastic cage is designed. The forward part of the cage now angles forward and then slopes inwards in a deeper ‘V’ shape. 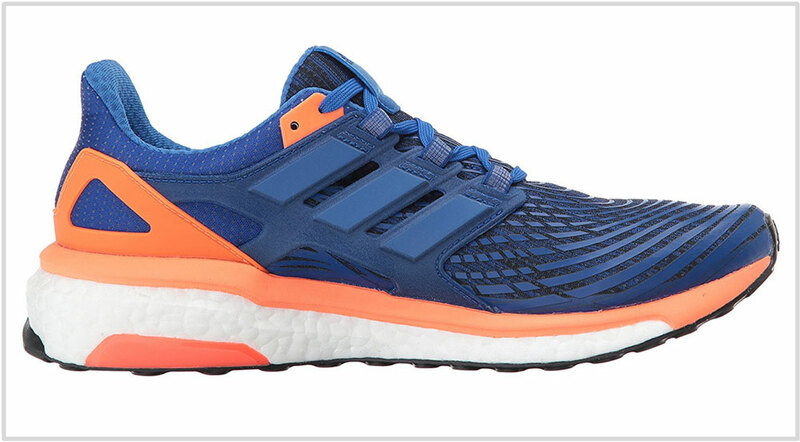 This is different from the Energy Boost 3’s relatively straightforward midfoot cage design. The side-by-side image above explains this update well. 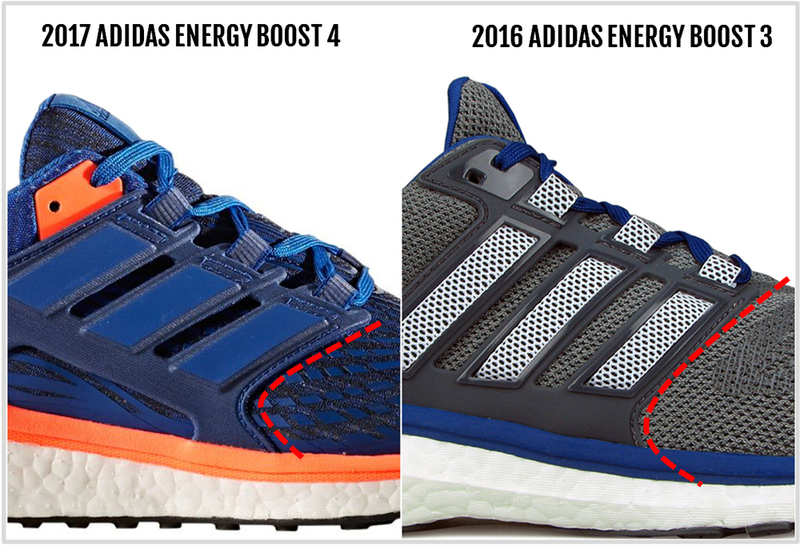 And like the EB3, the Energy Boost 4 does not have reflectivity. There’s a soft decorative trip over the tongue flap but without any reflective element. What you see is what you get on the Energy Boost 4. The rearfoot appears loaded with Boost, and the published stack heights validate that opinion. The heel stack is a generous 32 mm and the forefoot is 22 mm thick. This gives the midsole a 10 mm drop which is typical of mid-weight neutral trainers. Unlike the Ultra Boost, the Energy Boost has a midsole rim made of firmer EVA foam. It only forms the outer periphery and is not a separate layer over the midsole. This means that only the thick removable insole and the lasting separate the foot from the Boost midsole. There’s no change in the insole, but the lasting below it has been updated. 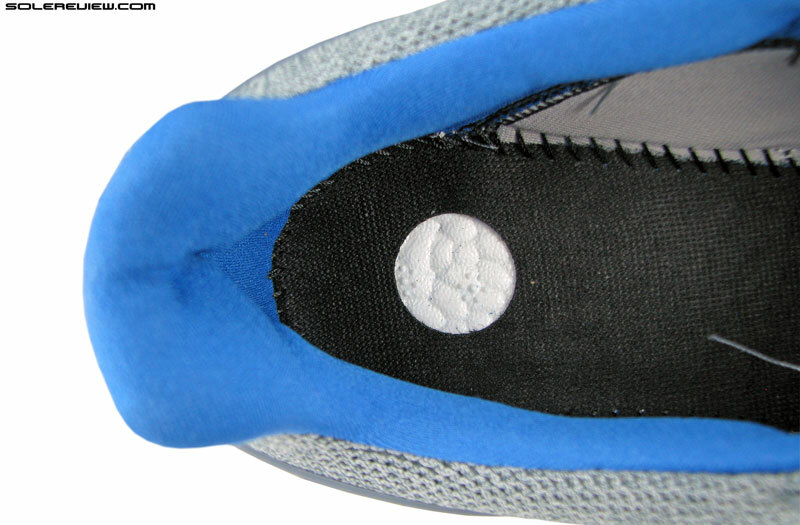 The EB 3’s fabric lasting only had a single circular opening under the heel. The Energy Boost 4 borrows the Ultra Boost lasting design which exposes the Boost foam in a lattice-patterned layout. The Energy Boost 4 transitions to the Stretchweb outsole seen on other models such as the Ultra Boost. While the Energy Boost 3 had a two-piece outsole with an exposed Torsion shank, the EB4 uses a one-piece outsole with a concealed Torsion shank. 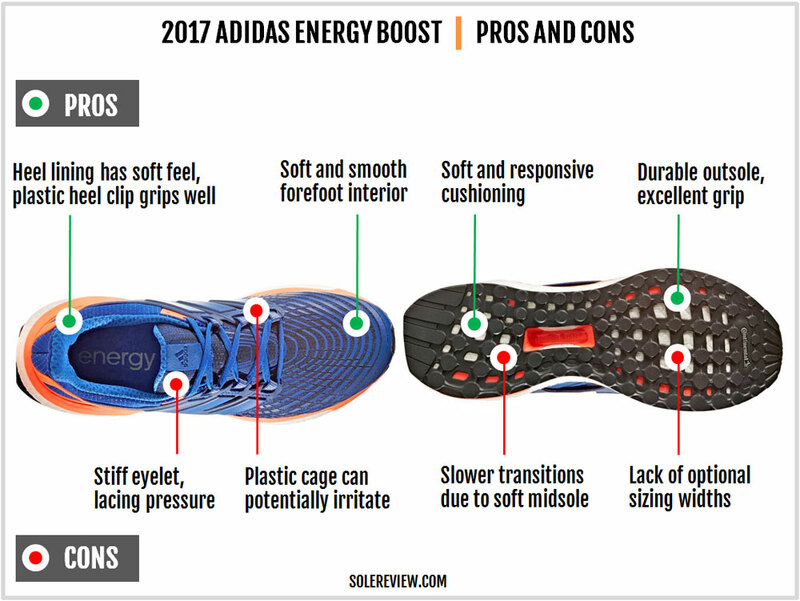 And yet, the redesigned Torsion shank retains some of the original Energy Boost’s features. For example, the Torsion shank has a four-way extension. Two thin ‘fingers’ extend further into the forefoot, and another pair extends towards the heel. One of the rearfoot extensions forms the medial support element and partially covers the midsole sidewall. Also worth noting is that the outsole is made of hard wearing Continental rubber. The EB V1 and V2 used Adiwear, whereas the EB 3 used regular unbranded rubber. 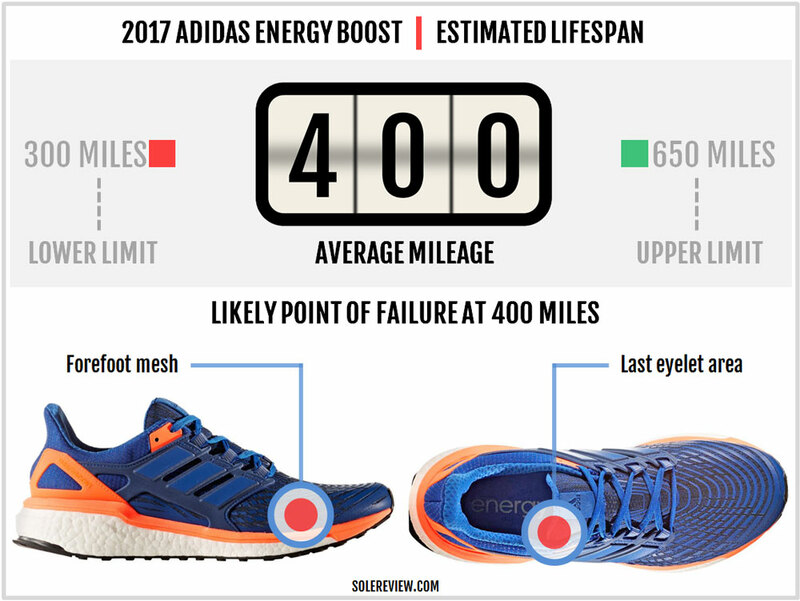 Given Continental’s legendary reputation for durability, having this on the $160 Energy Boost is a plus. The new outsole geometry now happens to be full ground contact; the Torsion shank is placed underneath the sheet of rubber. The heel edge maintains its angled bevel and is also reinforced with solid Continental rubber. This is designed to better withstand the wear and tear which accompanies rearfoot striking. All this material – be it the over-engineered upper, the high volume Boost midsole, or the one-piece Continental rubber – makes the Energy Boost heavy. It weighs 11 ounces for a half pair of US 9/UK 8.5, which is a couple of ounces over the category median. Expect no problems with the Energy Boost’s midsole or outsole. Boost does not lose its cushioning over time, and the hard Continental rubber has been battle tested. If anything fails, that would be the upper. The last lacing row is stiff and can potentially tear due to friction. This has been a recurrent issue even on models such as the Sequence Boost. The fabric tear will not affect the performance of the shoe in any way, but you should know that there’s a likelihood of that happening. 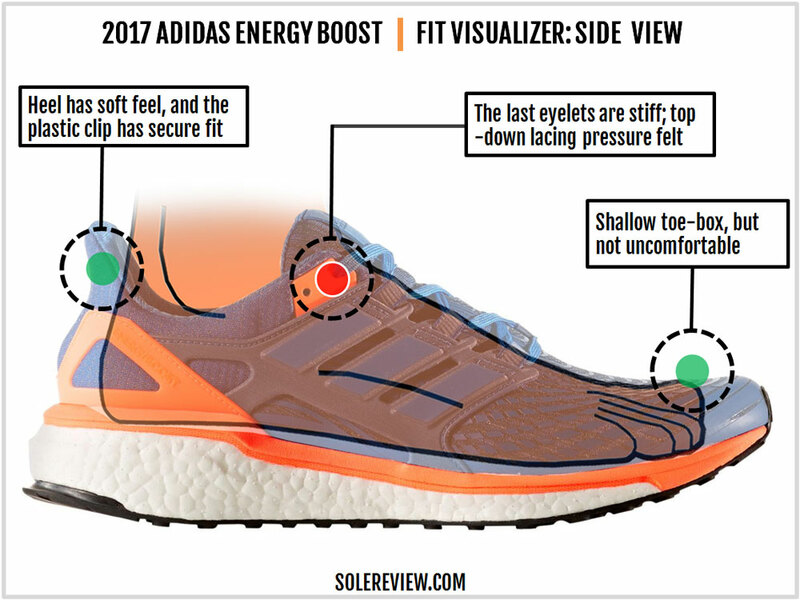 The Energy Boost’s upper fit has the same issues as before. The stiff midfoot cage applies pressure on the sides. Cinching the laces tight also leads to a noticeable sensation of top-down lacing pressure. 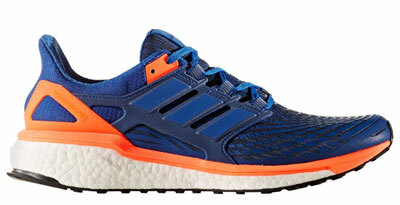 Unlike other running shoes, the Energy Boost has fewer lacing rows (4 primary + 1 heel lock). This increases the pressure over the foot because four rows have to do the work of six. But these two aren’t deal-breakers. Rather, the redesigned midfoot cage on the inner/arch side is. You see, the front portion of the 2017 Energy Boost 4’s midfoot cage slopes inwards and creates a V notch. What slopes in must also slope outwards, and in this case, there’s a thin extension of the cage over the midsole edge. So you get this feeling as if there’s something pressing under your arch. Needless to say, this isn’t good when you’re planning longer runs on the Energy. The high-density printed mesh also lacks ventilation, so the Energy Boost will run hot. Take note if you’re planning to use the shoe in warm weather. 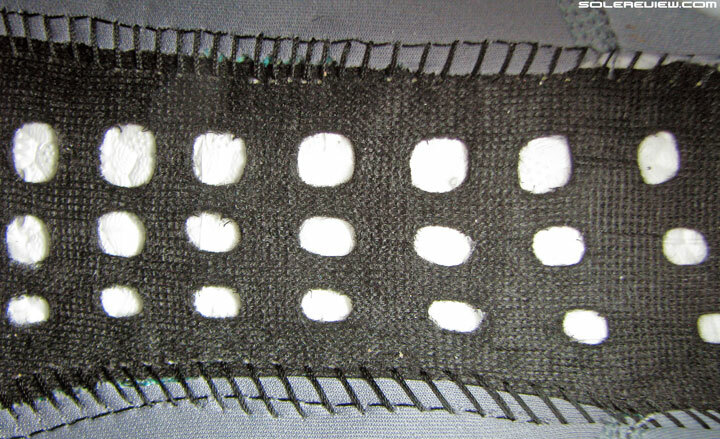 The last eyelet has a lot of stiff layering, so this part needs some time to break in. This has been a common problem with adidas running shoes and was observed on the Sequence and the Glide. Barring the midfoot design, other areas are an improvement. The forefoot feels (more) spacious, and the toe-box doesn’t feel uncomfortably shallow. The Techfit mesh is softer and more stretchable than the EB3’s mesh. And the same V notch which is an issue on the arch side ends up easing the forefoot pressure. The heel has a secure hold. The external clip does a good job of holding the foot, and there’s plush padding inside. 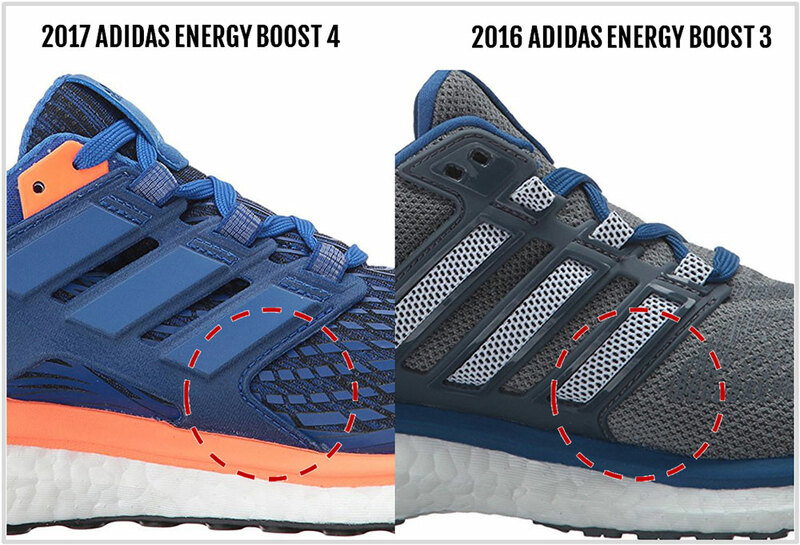 As far as the stick length goes, the Energy Boost 4 has slightly more room than the EB3. That said, we’d still recommend going a half-size larger instead of true to size. If not for the faulty upper design, the Energy Boost could have worked well as a shoe for marathon distances. But due to the midfoot cage, it’s best that you limit the shoes to a half marathon or shorter. Even if you did not have a problem with the cage, the Energy Boost isn’t a fast shoe. The high volume Boost midsole impedes fast transitions, and it doesn’t matter whether you’re a forefoot or rearfoot striker. If you land on the rear, then the thick stack tends to slow down progressions. If you’re forefoot striking, you still need to complete the gait cycle by partially transitioning to the rearfoot. Also, know that the Energy Boost 4 is softer than the V3. We believe this has to do with the extra perforations/windows in the lasting below the insole. The covered lasting in the EB3 added a wee bit of firmness. Now with the lasting going the Ultra Boost way, that element of firmness is lost. On a positive note, the midsole is super cushioned and has decent responsiveness. 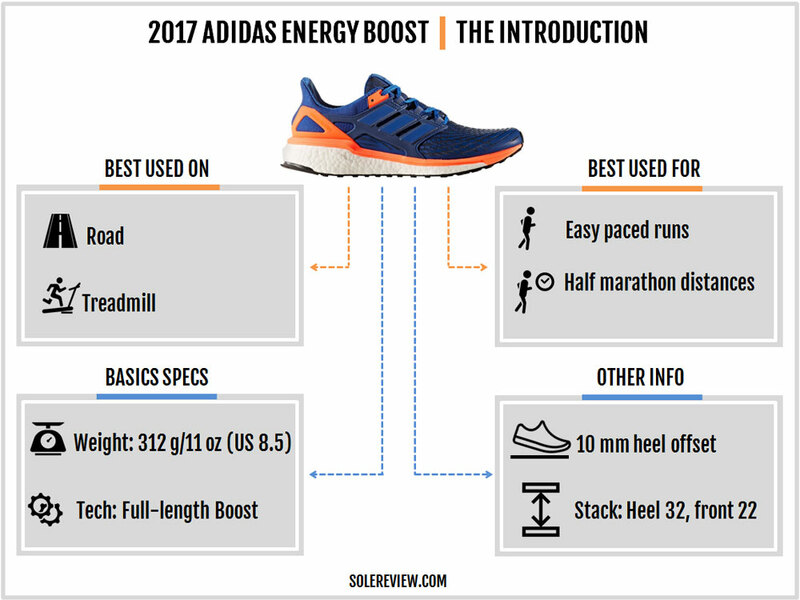 The Boost material has an inherent springback quality, though the Energy does not feel as responsive as a Boston or one of the older Glides. The switch to a Continental rubber outsole also bodes well for transitions and grip. The layout now covers the Torsion shank, so the midfoot transitions feel smoother. The rubber grips better too. The heel maintains the beveled angle, thus making landings smoother for rearfoot strikers. The Energy Boost isn’t the epitome of stability. But it at par with the updated Supernova and certainly better than the Ultra Boost. There’s no nervous rearfoot lean even with the thick midsole stack. 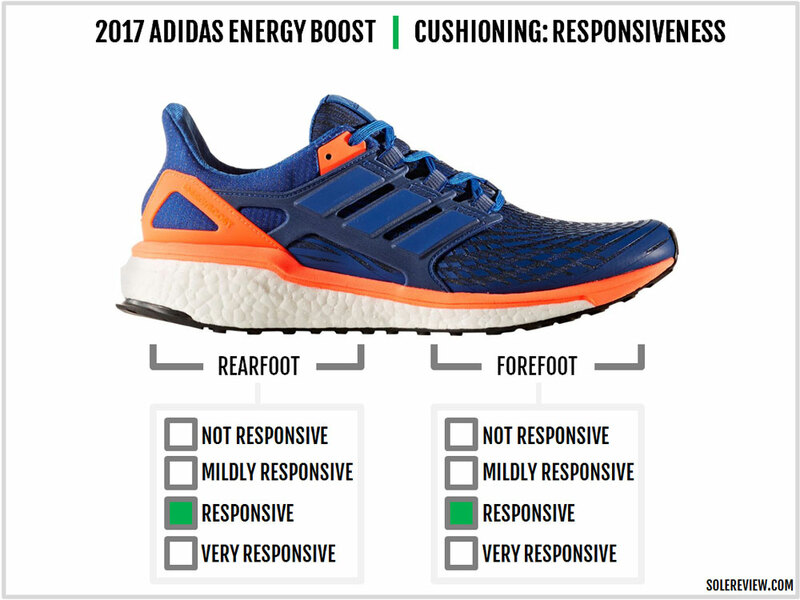 The things we liked about the past two EB models also apply to the Energy Boost 4. 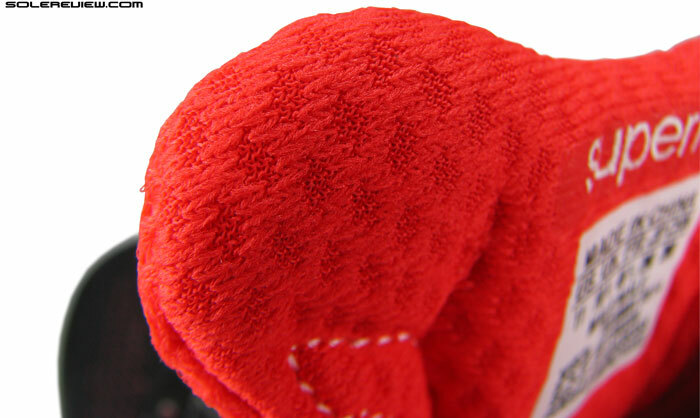 The midsole is super cushioned and the outsole is extremely durable. The improved upper mesh feels great over the foot, and the shoe has a secure fit quality. Among the dislikes, the plastic cage is the #1 item on the list. Even with the updated V notch design, the stiff component ends up applying pressure. 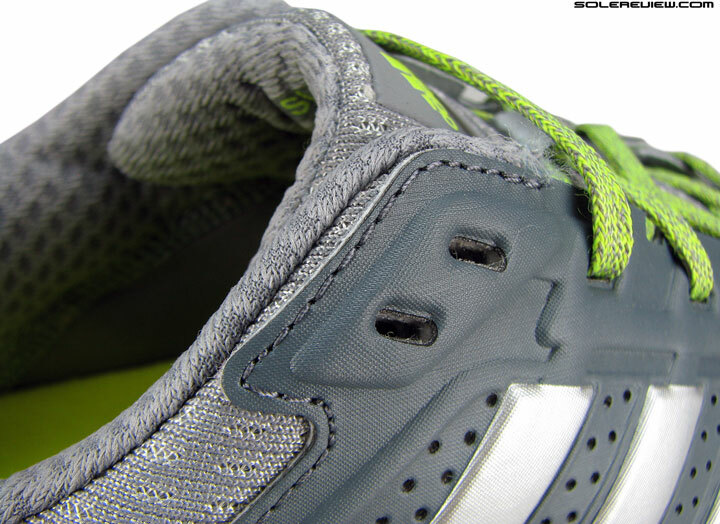 Also, the lacing depends on only four eyelets, so you’ll feel the top-down pressure if the laces are cinched tight. There are a couple of other minor negatives. 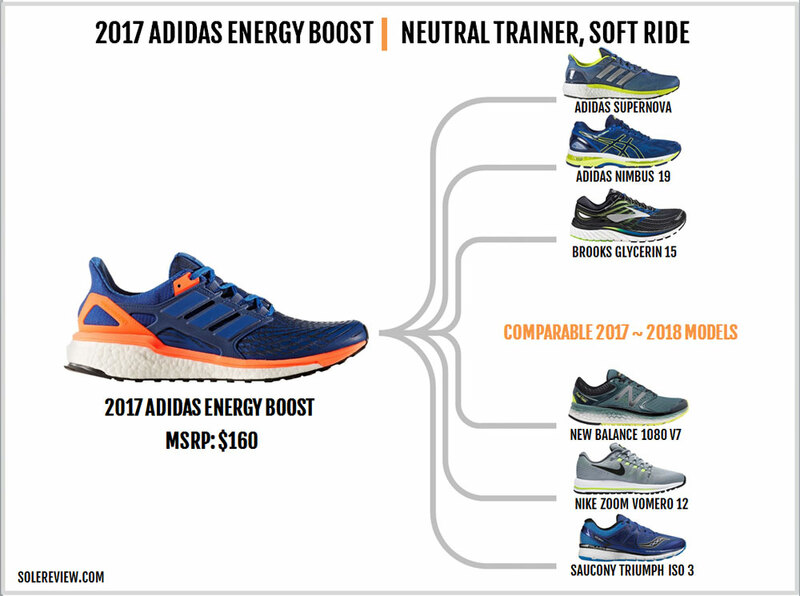 The Energy Boost $160 is expensive considering the availability of other Boost models. Secondly, there’re no additional widths for an expensive shoe with an imperfect fit. The last one is subjective. The Energy Boost isn’t fast; it is slower than the earlier Energy Boosts. Blame the generously perforated fabric lasting which makes the midsole ride softer. 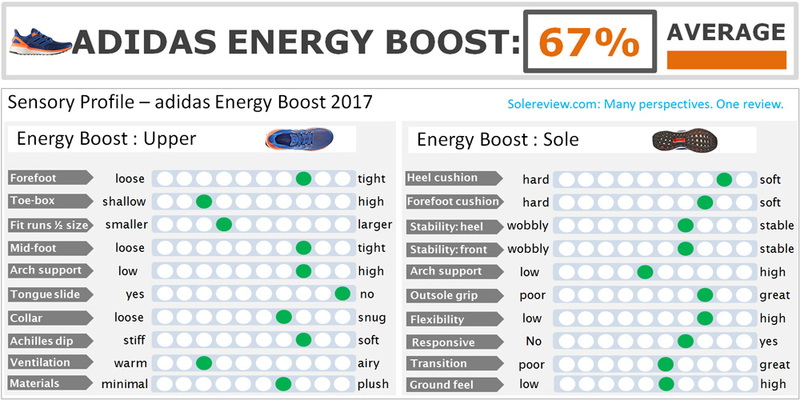 Barring the midfoot cage, the Energy Boost 4 would have been an improvement over the EB3. After all, the new mesh is far more comfortable than the EB3, and the midfoot cage’s V-notch eases pressure on the sides. The outsole is now Continental which means a longer life and better grip over surfaces. The Energy Boost’s midsole retains the plush cushioning and responsiveness from the earlier models. But considering the new midfoot cage design can be potentially irritating, it makes more sense to get the Energy Boost 3 instead. Or if you want something cheaper, then the Supernova is a suitable alternative. Till the 2017 Glide (now called Supernova) showed up, there was a healthy amount of separation between the Energy and the Supernova series. But that changed with the 2017 release of the Glide. The new Supernova has a high volume Boost midsole, so the cushioning quality isn’t all that different from the Energy. The outsole durability levels are nearly identical. This isn’t surprising given that both models use a single-piece Continental outsole. Where the Supernova differs from the Energy is in the upper design. It has more interior space, but the forefoot mesh feels stiff in comparison to the Energy Boost’s Techfit material. The Supernova also lacks an inner sleeve. But considering the lack of the plastic cage, the Supernova is better suited for longer runs. The bottomline is: if you don’t mind the tacky Supernova upper, it’s a good deal for $30 less than the EB4. The rotational recommendation in the Energy Boost’s case is easy. Use the cushioned Energy Boost for leisurely paced runs, and get the firmer Boston 6 for fast training and races up to a half marathon. The adios 3 works well for races of 5K, 10K, and up to a half marathon. If you think that the adios and Boston are too similar, then get the adidas Takumi Sen. This racing flat works great for quick 5K and 10K paces. Buy the Asics Dynaflyte 2 if you want to limit your adidas purchase to just the Energy Boost. It is a Boston 6 equivalent and performs well as a fast-training shoe. The New Balance 1400V5 is the counterpart to the adidas adios, and the New Balance Hanzo is similar to the Takumi. 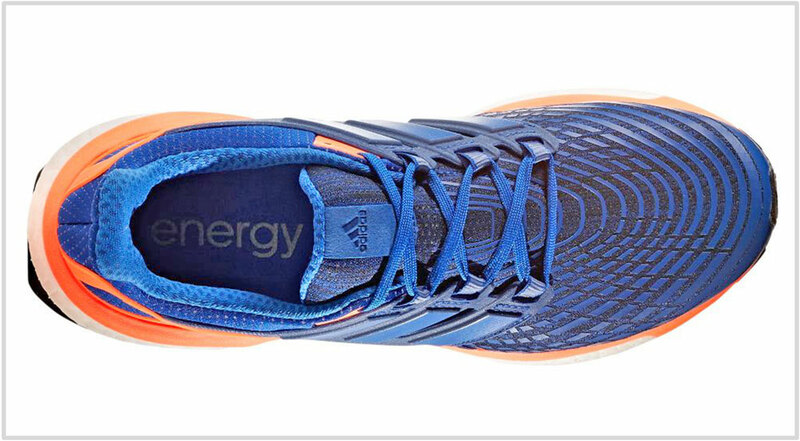 The Energy Boost competes with the similarly cushioned and cheaper Supernova. Barring the Techfit upper and the sleeve, the Supernova possesses most of the Energy Boost’s capabilities. The Asics Nimbus 19 is a firmer riding shoe with a better upper fit than the Energy. The Brooks Glycerin 15 has a smooth ride and a plush upper, though it remains to be seen how the upcoming Brooks Levitate compares with the Energy. The same can be said of the soon-to-be-released Saucony Triumph ISO 4. 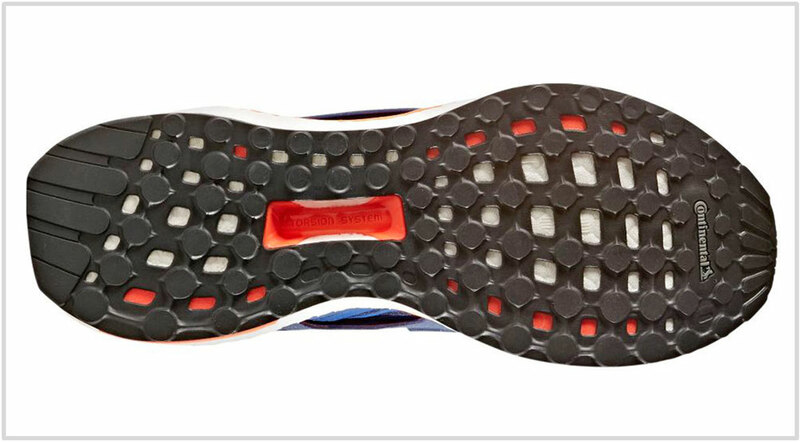 Unlike the Triumph ISO 3’s midsole with partial Everun foam content, the ISO4 will feature a full-length Everun midsole. And a topsole over that, no less. There are a couple of other premium neutral running shoes in a similar price class. The Nike Vomero 12 has a smooth and responsive midsole which mated to a seamless upper. In these times, the New Balance 1080V7 lags behind the rest. Its single-density EVA midsole isn’t deserving of the high sticker price; the cheaper Boracay V3 is a better buy.